I bought this book, brand new off the shelf for 75 cents, in 1968 or 1969, when I was a teenager. 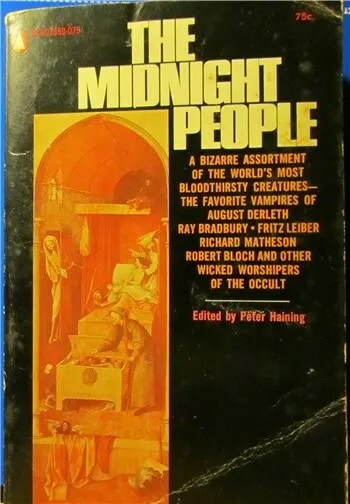 While The Midnight People is ostensibly a vampire anthology, Editor Peter Haining chose to include a couple of stories in which the vampire tag is debatable. The book is stronger for those choices, however. 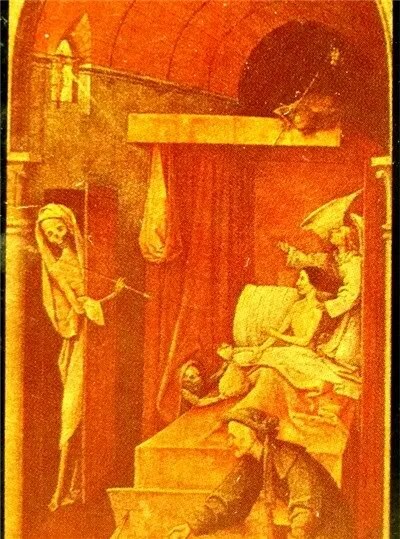 The cover features a painting by Hieronymus Bosch called Death and the Usurer, also known as Death of the Miser. The Midnight People is an almost perfect example of the kind of books I loved to pore over when I was a kind, reading not only the stories, the introductions and front material, which usually included a list of when and where the stories first appeared (usually magazines), with copyright information and so on. The only reason this is not the perfect example of my collection is that it does not include the list of sources. Of course, that’s no problem, now that we have the internet. After the Introduction, the collection begins with an article by Montague Summers (1880 – 1948) about real-life German serial killer Fritz Haarmann (1879 – 1925), who was known as “The Hanover Vampire” because he actually murdered his victims by biting into their throats. Montague Summers was a strange character himself. He studied theology at Oxford, became a Deacon in the Church of England, then converted to Catholicism, and gave himself the title of Reverend, although historians have found no evidence that the Catholic Church ever officially ordained him as a priest. Summers had peculiar interests, ranging from occult (vampires, werewolves, and witches) to deviant sexual practices (the Marquis de Sade and the Greek chronicles of Antinous and Hadrian). In 1928, Summers published the first English translation of Heinrich Kramer’s 1486 treatise on witchcraft, Malleus Maleficarum (Hammer of the Witches). M. R. James’ An Episode of Cathedral History is one of my favorite supernatural stories, combining, as it does, James’ vague but chilling depiction of an undead thing escaping from a tomb under a church, with a storyline that literally defines the gothic horror genre. “It was in 1840 that the wave of the Gothic revival smote the Cathedral of Southminster,” says the old church caretaker, Mr. Worby, referring to the 19th Century fashion trend of restoring authentic gothic structures and by building new structures in a mock Gothic style. Worby explains that a church official, intent on having a Gothic style cathedral, ordered carpenters to remove most of the sanctuary’s beautiful handcrafted woodwork, including the podium, under which was discovered a stone slab that sealed the mysterious tomb. Most people know the story of how John Polidori wrote The Vampyre as the result of a challenge by Lord Byron to a small circle of friends, which included Mary and Percy Shelley, to each write a ghost story. Mary Shelley eventually wrote Frankenstein (1818) as a result of that challenge, and Polidori wrote The Vampyre (1819). This was not the first vampire story ever written, but it was probably the first one written in English, and it set the now-familiar image of the vampire as aristocrat – a cloaked lord or nobleman, Byronic, decadent, and darkly romantic. 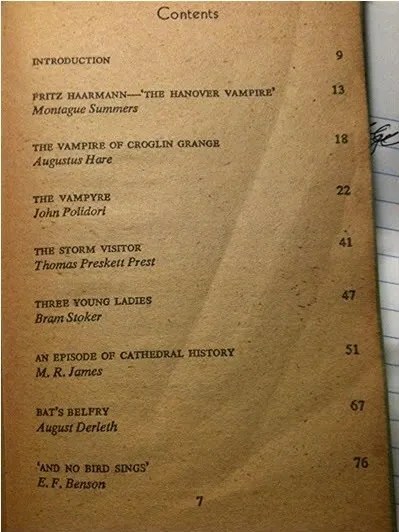 Editor Peter Haining tells us that Bat’s Belfry is one of August Derleth’s first horror stories, containing “certain elementary mistakes which can be expected from any young writer.” This is a whopping understatement. It’s a silly hodge-podge of supernatural motifs. 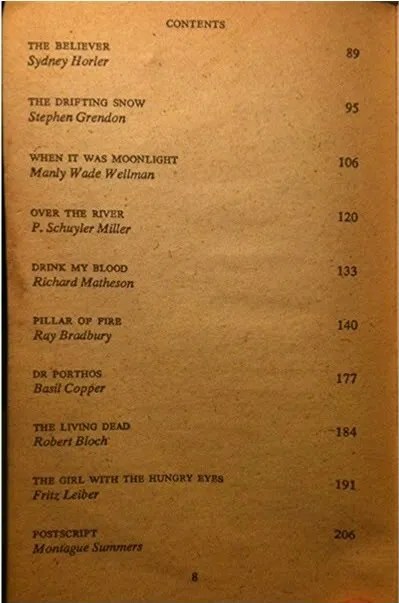 I should add that I greatly admire Mr. Derleth for his industrious achievment, along with Donald Wandrei, of establishing Arkham House Publishers, a classic small press success story. I simply don’t know why Haining chose to include this story, unless it was for Derleth’s name recognition among the H. P. Lovecraft fans. I’m as exciting about ebooks and their possibilities as most other modern publishers and readers, but sometimes it is still fun to consider the print book as art and artifact. I hope to make “Bill’s Bookshelf” a regular feature here at Bill Ectric’s Place.